It really makes you don’t feel like visiting the place again. Posted on January 2, 2010 by Jian Akiraceo. This entry was posted in Rant and tagged bad mood waiter, bad service, comic, customer service, dark face waiter, vivo. Bookmark the permalink. Lol!!! 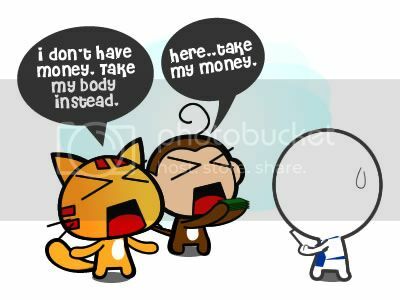 Take my body instead….xD xD xD Funny!!! ya.. I feel that no matter how tired or unhappy they are, they shouldn’t show it on the face and give it to the customer. This is about professionalism. Not smile is okay but don’t give the feeling of unwillingness to serve, right? Some manager doesn’t seems to care 1..
LOL like the chicken incident? Is the waiter looks really angry? Service etiquette is certainly a rare encounter nowadays. They no longer work passionately but work coz of $$$ to buy something. slap the waiter nx time. Reminds me of Hong Kong, great cartoon, I love this. I apologize if anyone find my word sensitive. Cheers! i always have that time of moment whenever me and family ate at one of the mamak stalls here..
they never tend to smile, but they didn’t put a scaary face..
as long as the attitude is good. Well, with the pay so low, I won’t be able to smile. But of course, professionalism must still be there to be successful in any work. Ya no smile is okay but the attitude of don’t wanna serve/work and giving out black faces really not that good eh.